A view of our meal at the Greek restaurant near TechyDad’s parents. LOVE their food and wish we had a Greek place near us. Wow, that food looks spectacular! 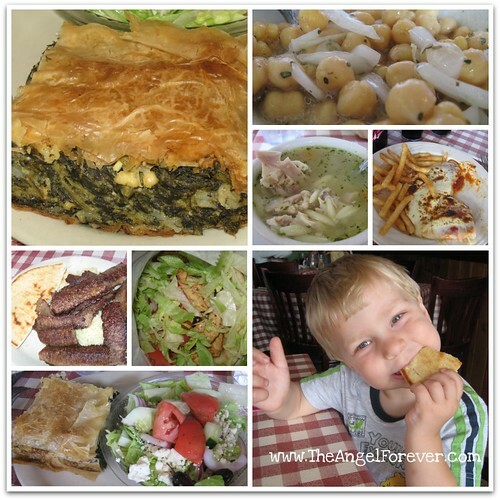 I’m ready to eat Greek! Your little guy is adorable! YUM! Now I am hungry. Looks yummy – even first thing in the morning! It should be noted that the chickpeas weren’t as good as they usually are. (I wrote about them here: http://www.techydad.com/?p=3535 ) This turned out to be a good thing, though. There was too much lemon flavor in them which alerted us that lemon was the missing ingredient when I tried recreating them. It seems to be chickpeas, chopped onions, olive oil, lemon zest and oregano. Now, I must experiment to find just the right levels and I’ll be able to eat this any time! Yum! I love a good Greek salad. And spanakopita.